The other day, I got up close and personal with one of the Devil’s darning needles. Yeah, I had a dragonfly perched on one of the pods of the scarlet runners that I plant on my deck for the hummingbirds and bees (if I get beans, it’s a bonus). This dragonfly was very patient as I got closer and closer, and went and dug out the proper camera instead of my phone, and inched even closer. There’s a post on writing in there, but that’s a post for another day. Today is all about the adder’s servant, the gwas-y-neidr, thank you Wales. I love dragonflies. I have three (I think) dragonfly necklaces. I don’t know why I like them so much, but if I were to get a tattoo, I might be the girl with the dragonfly tattoo. Though it would probably have a dragon’s body with dragonfly wings, sort of like this one. It might be their speed, the way they flit about. The Smithsonian website lists them as the fastest flying insects, with flight speeds up to 56 kph (35 mph), and one species migrates between India and Africa! It might be that they eat loads of mosquitoes and other pests. Though they also eat butterflies (not so good). Or maybe it’s their ethereal bejewelled wings — they look like creatures out of a fairy story. When I taught English in Korea, I gave one of my classes the assignment to write a fable. 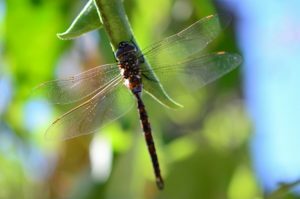 As an example, I wrote up a story on How the Dragonfly Got Its Wings. I’m sure I’ve lost the story, I swear I don’t have it anywhere…it will never see the light of day. But it had something to do with the stars. Besides the devil’s darning needle, they have folknames like eye snatcher and snake doctor, the latter based on the tale that they stitch up wounded snakes. I also like one of the German names for them – Wasserhexe “Water Witch”. the hobby of seeking out and watching dragonflies is called Oding, after the Latin name for the order, Odonata. If you practice this, you’re an oder, which is not odd at all. Swedish folklore has a story that the devil uses dragonflies to weight a person’s soul. 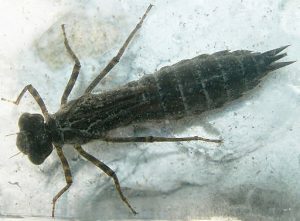 The larvae can eat tadpoles and small fish! Plus their larvae look like aliens. What’s not to love?